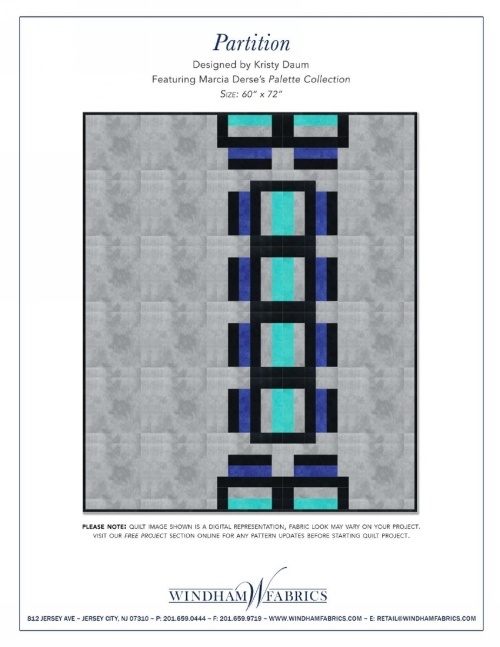 Windham Fabrics asked me last year if I would create some quilt concepts for their Palette and Artisan Cotton collections. I designed quite a few things and in so many color variations that I imagine it was hard for Windham to chose; but chose they did...three in all. You might remember the SPIRAL BOUND quilt that I showed a week or so ago, it was part of this group. Today I'm sharing with you another of that group, this one is titled PARTITION and is worked up in Palette from Marcia Derse. I had a lot of fun playing around with colors, as you can imagine if you check out the color range [Palette Collection]. The nice thing about this quilt is that it is great for a beginner as the block goes together quickly and with minimal piecing. The fact that it is asymetrical and not centered is something I definitely insisted on, as I believe it adds to the appeal.